Bombastic Bag Man Heading to Spider-Man? Marvel Games is finishing up their Fantastic Four week with a teaser that one of the FF themed costumes is heading to PlayStation's Spider-Man. It's either Bag-Man or the Future Foundation suit. Probably gonna be Bag-Man, though. I hate the bag man suit. Artists gotta work on something at this point. So he's an 80s Saints fan? After they removed Venom, he had no costume so he borrowed a FF costume and a paper bag and the Human Torch put a "Kick Me" sign on his back. Pretty funny bit. 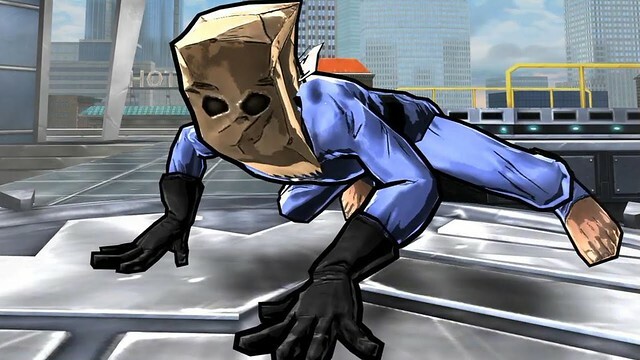 It is also just as likely they will include the black and white Future Foundation suit, which is pretty generic so I do hope they go with Bag Man. The Amazing Spider-Ham or GTFO.